Holiday season gets more and more eventful every year for me. With family gatherings, travel, work, gift shopping and living in a prime holiday shopping area, the holiday season can start to look pretty crazy for me starting in the middle of October. And as I’m writing this, I know that it’s far from over. Every once in a while, it’s kind of nice to sit down, take a deep breath, relax, and shoot a glass of whiskey. And by shoot, I mean take a picture. 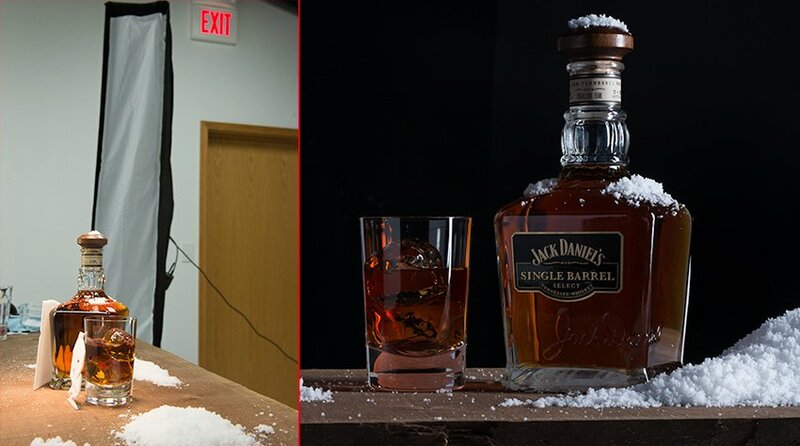 This being a Christmas / New Years holiday liquor shot, and living in the Chicago area, I knew that I wanted to incorporate snow. 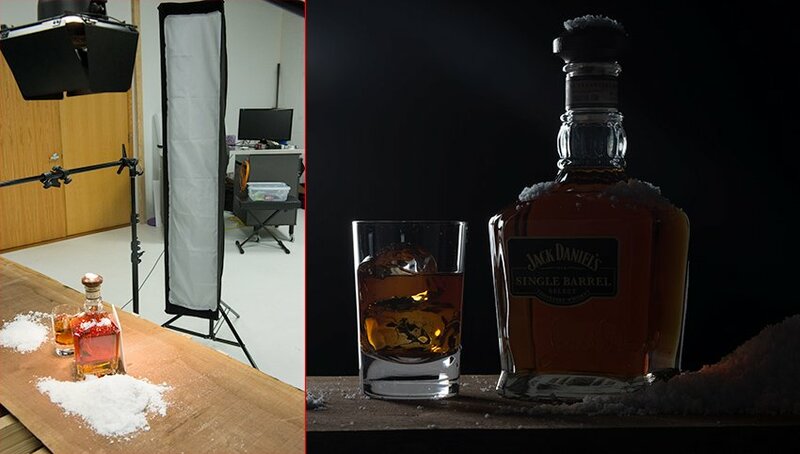 Once I knew that I was shooting whiskey, I knew that I would want to play with the warmth of the whiskey color and contrast it with some atmospheric coolness. As I continued to conceptualize, I pictured a hardwood surface that would give the image an organic feeling, and some bright back lighting. I toyed with the idea of using bokeh filters with Christmas lights in the back (and you’ll see in the BTS shots that the Christmas lights were still up), but as I continued to work, I felt like the lights were really detracting from my subject. I couldn’t make the concept work in a way that didn’t draw too much attention to the lights, so I shifted direction in the middle of the shoot. Before I talk about the lighting, let me mention a couple of the products I’m using. The snow is a polymer synthetic called Insta-Snow by Be Amazing! Toys. It’s a Superabsorbant Polymer (SAP) that comes in a powder form and expands up to 100x its original size and 500x its original weight when you add water. When you add water, the powder takes seconds to absorb and expand. It’s moist to the touch and you can pile it easily. It won’t shape, so don’t try to have snowball fights with it or anything. After the powder has absorbed and expanded, I mixed it up a little with my fingers to make it as even as possible, and simply dropped the snow into place. Once you are finished with the snow, you can brush it into a container and allow it to dry. If you add water to it again, it will reconstitute, so the stuff is reusable. The “whiskey” in the glass is a mixture of soy sauce and water. After multiple experiments with teas, cola, and pretty much anything with a dark brown color, I’ve found soy sauce to be one of the most economical and consistent ways of creating convincing amber liquor substitutes. Finally, let’s talk about cellfoam. Cellfoam is an extruded closed-cell polystyrene foam that is typically used for crafts and architectural scale models. It’s rigid so it will stand on its edge. It’s also very brittle and very easy to cut into precise shapes with an Exacto knife. You can see below that I’ve used this as the back diffuser for the bottle and the glass. I’ve cut holes into the foam behind the glass to let some of the dark background through, breaking up the refraction of the ice. 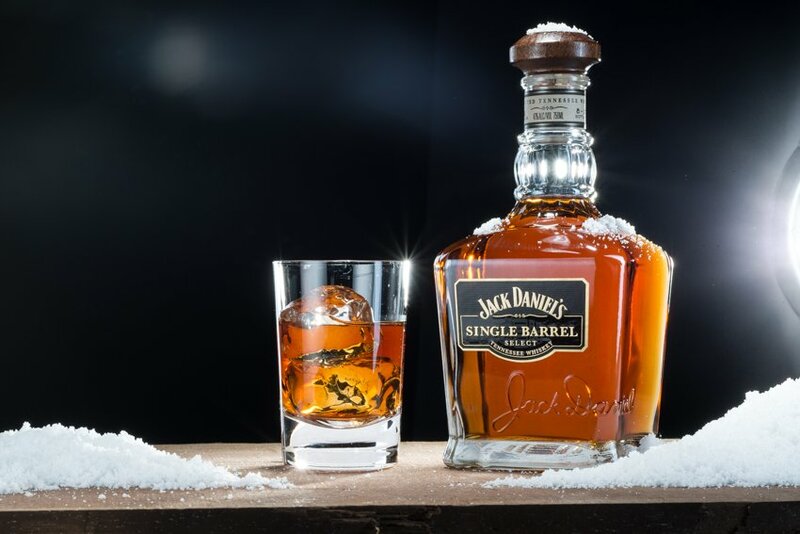 If I hadn’t, the glass would have a solid background, which would flatten the character of the ice making it look cloudy and uninteresting. Cutting holes allows some specular highlights from the backlight and some contrasting dark areas that give the ice its crystal quality. 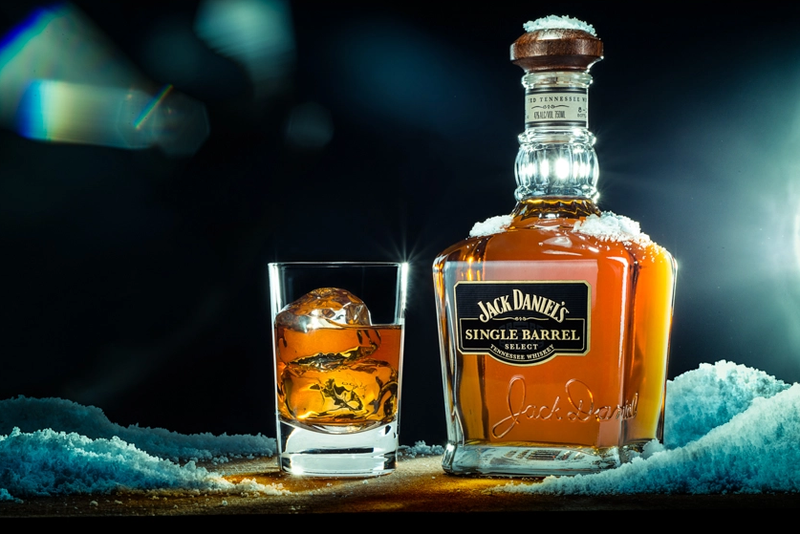 There is also a small stem that I put at the top that gives a nice highlight behind the ice above the surface of the liquid. You can find cellfoam at a crafts store in small quantities. I bought mine (1/8″ thickness) at Hobby Lobby. If you by online, you may end up having to order larger quantities. I took this holiday liquor shot with a Nikon D800; me 36.6mpx resolution. The Horseman LD bellows system allows me to tilt the standards to change my focus plane and shift the standards to correct perspective. My shutter speed was 1/125 of a second, aperture was f/20, ISO 100. Below is a shot of the entire lighting setup. I’ll go through the lighting light by light, but here’s so you have an overall perspective of what this looks like. You can see in the back that I still have Christmas lights up. That concept was changed as I moved along with the shoot. My shooting surface is not ideal. This is an 8/4″ thick 8-ft walnut board that I have laying around in my studio that is being kept for a special building project. Eventually, I will have a finished 24″ x 24″ wood surface for shooting on so I can get my lights closer to the subject. 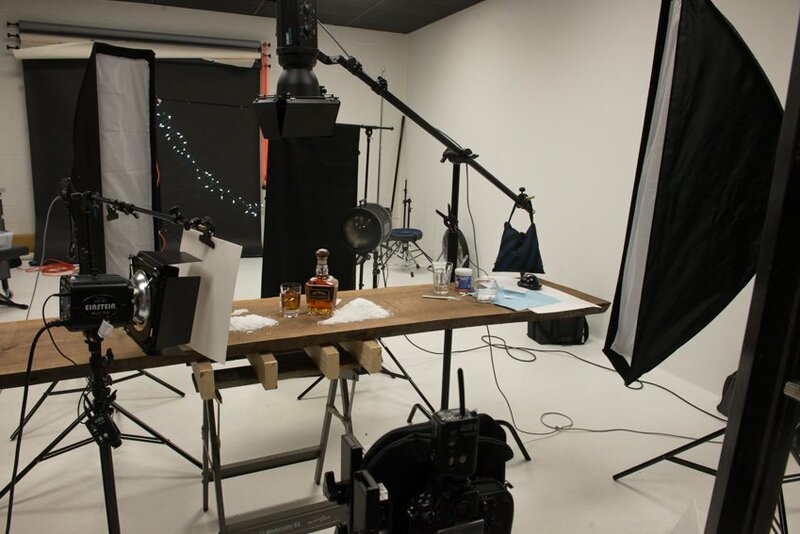 The smaller your shooting surface, the more control you will have over the lighting and placement of lights. Sometimes, you work with what you have, though. Even though I start with a concept (which is sometimes sketched out), I always build my lighting one light at a time. 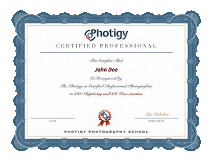 This ensures that I have all of my reflections and shadows the way that I like them. I started this one by establishing my top light first. The barn doors and grid filter keep the light focused on the subject without allowing light bleed into unwanted areas. 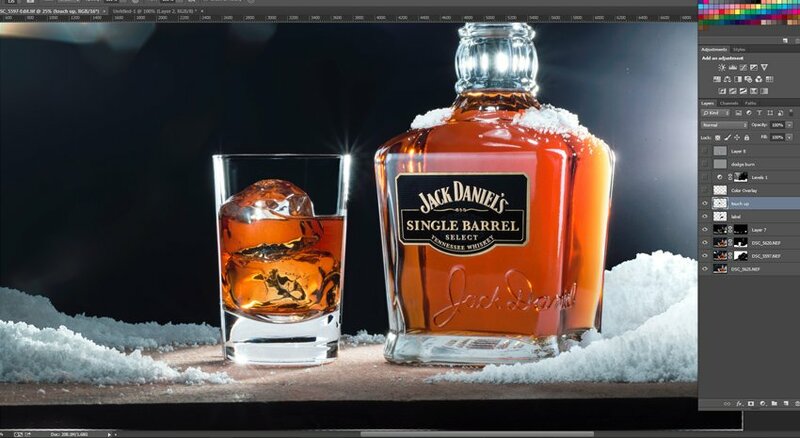 You can see that we’re getting the rim of the glass and creating some highlights on the ice and bottle. 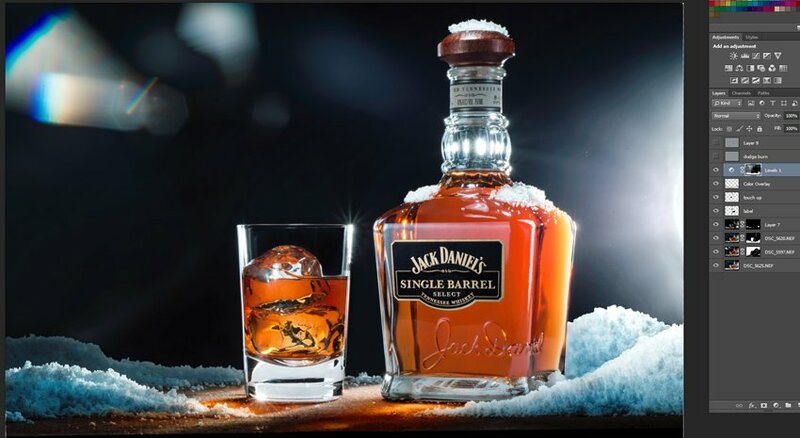 The highlights on the side of the bottle are being created by the reflection of the snow, which is also beginning to separate out the embossed “Jack Daniel” on the side of the bottle. This is probably our most important light. I’m using a Bowens Fresnel 200 modifier on this light. The “fresnel” (pronounced frey-NEL) is a glass lens with ridges or waves that was invented by French physicist Augustin-Jean Fresnel specifically for focusing the light beam of lighthouses. This light modifier has an aperture that allows me to focus my light like a snoot or flood light in depending on how open/closed it is. This does not have a focusing lens, so it won’t work as a projector modifier. Here’s how the setup looks using only this light. With the foam behind the glass and bottle, the back light illuminates the amber whiskey. 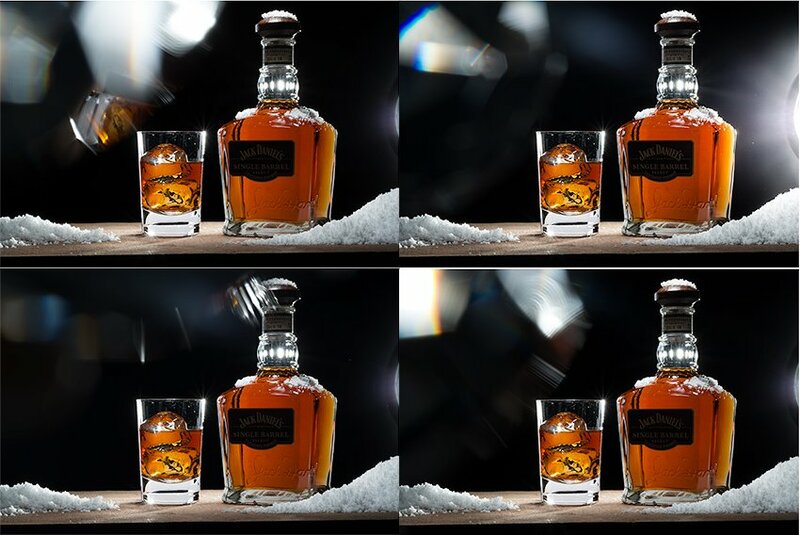 Since the light modifier is not diffused, we also get “pin” highlights in the glass and neck of the bottle that are very focused. At the same time, since the face of the light is fairly large unlike a snoot, we are seeing the edge highlights on the neck label and the cork stopper as well as the right edge of the glass. The flare on the right edge of the frame is created by creeping the light into the frame a little and making sure that some of the light is spilling into the lens of the camera. You will also notice that the front label is illuminated. This is caused by a foam diffuser board that I have placed in front (and to the left) of the composition that I will discuss next. We saw in the last image that the label was being illuminated by reflected light from the back light on a diffuser board. However, this amount of reflected light is not enough to illuminate the label completely and show all of its detail. So, behind that cellfoam diffuser, I have a light. Here we’re seeing a fully illuminated label. All of the detail in the label is showing and the contrast between the matte and coated black is showing up clearly. We also have a nice highlight around the edge of the label that shows the shape of the glass. And the “Jack Daniel” embossing is starting to come to life with highlights and shadows. Also, we can see the neck label clearly. However, we’re creating some unwanted reflections on the glass. I dealt with this in post, which I’ll talk about in a bit. Another nice “side effect” of this light is the glare we’re getting above the glass and bottle. When I was conceptualizing, I knew that I wanted a lot of interesting glare and light being thrown around the composition. I felt that it would give an interesting atmosphere and help with the contrast between the cools and the warms. I also planned on lights or glare helping to balance the scene. In order to allow for all of this light scattering within the lens, I shot the composition without a lens hood. When you shoot without a lens hood, any light that is directed into the lens will create light scatter. 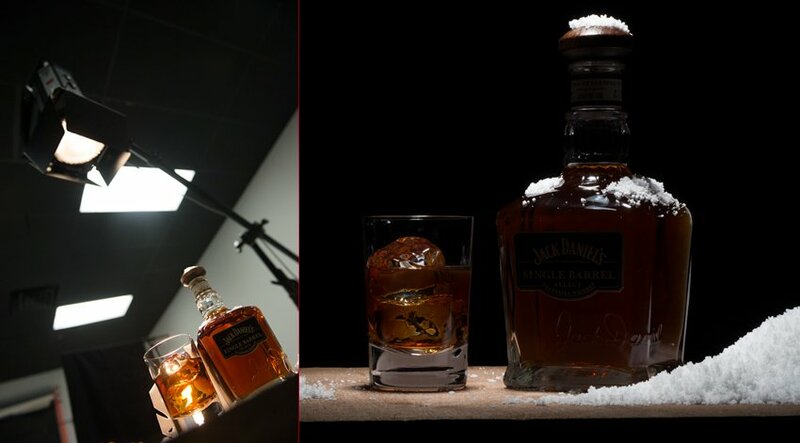 So far, we’ve dealt with every thing that illuminates our whiskey, labels, etc. But, I’m always conscious about the edges of the subjects. 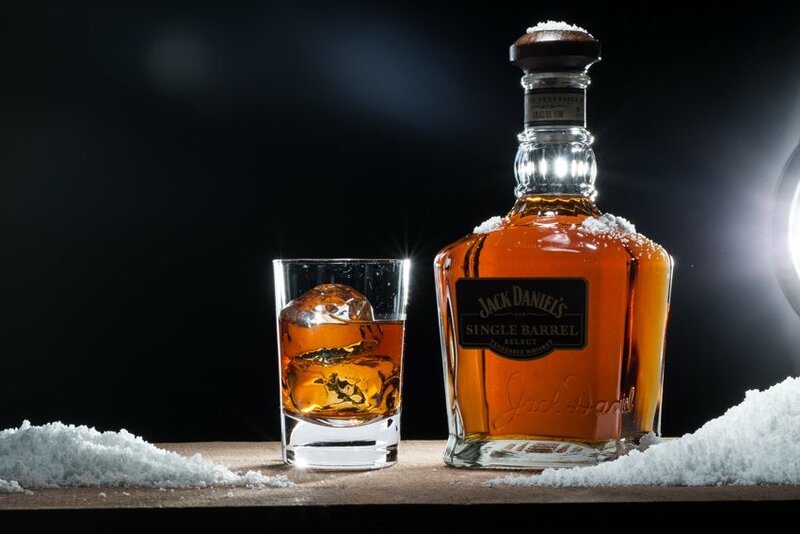 Without defining the edges of the glass and bottle, we can quickly loose confuse the viewers and cause them to stare at your image trying to figure out what’s going on. While we all want people to look at our images for longer periods of time, we don’t want it to be because they’re confused. Defining the edge also makes it clear to the viewer what is supposed to be drawing their attention. In order to do this, I used a couple of strip boxes. As you can see, we have one strip box behind and to the left, and on in front to the right. 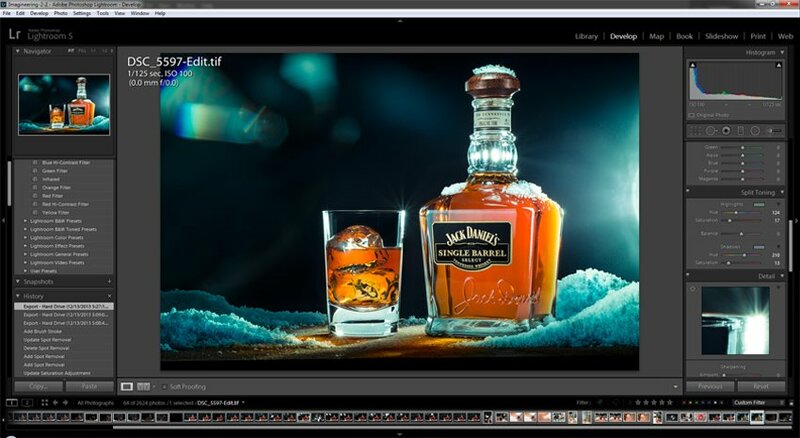 The box on the left is creating edge highlights on the glass and bottle. The box on the right is helping to define the shape of the bottle by putting a highlight on the front corner of the face of the bottle, as well as further define the roundness of the cork stopper. Let’s take a look at what this shot looks like with all of our lights on. We have some nice highlights all around the bottle. 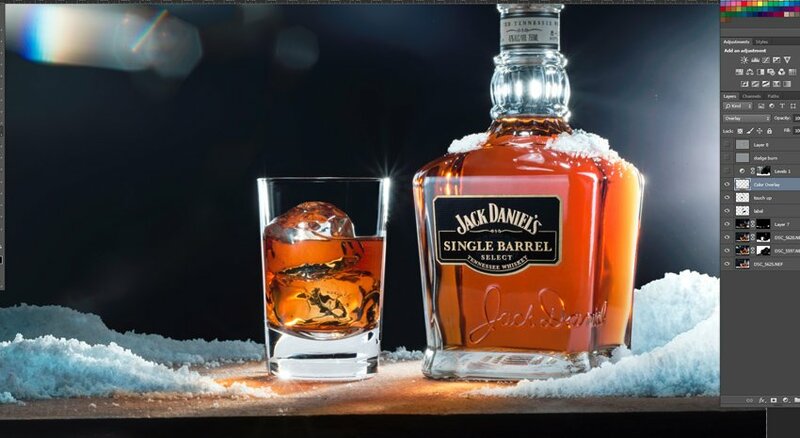 I like the glare that we’re getting, the edge of the glass, the contrast of the darks and lights in the ice. But, we’re still getting a lot of unwanted reflection on the glass and the image still feels heavy on the right side. 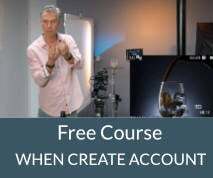 To address the unwanted reflections, a simple second shot takes care of it. We simply need to turn off all the lights that we don’t want. This is much more manageable. I can easily clean up the scratches/scuffs on the glass in post. Balancing the bright light on the right is a little more tricky. The best way to add balance to light is with more light. The Christmas lights were supposed to do that at first, but I had quickly decided that it was too distracting. I had to find another way. That’s where my glass crystal comes in. 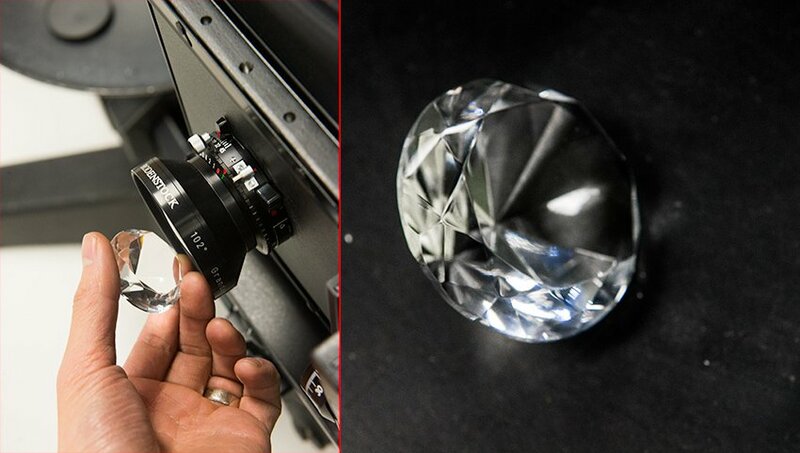 By holding the crystal up in front of the lens, I create light refractions that are directed into the lens. The results are quite interesting. We get the feel of bokeh, but since the crystal is cut at different angles, we get a more interesting shape of light than Christmas lights. Here are some of the results. So, now we have our establishing shots, it’s time to make a picture. 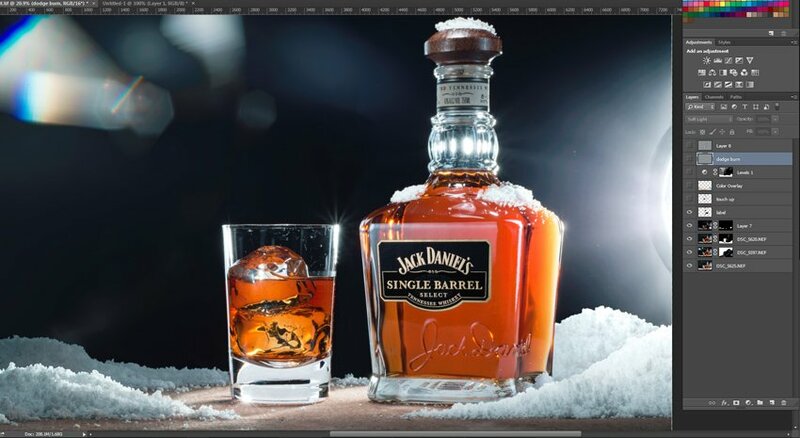 First, I combine the shots (primary, glass, light refraction, label and extra snow) in Photoshop using my primary shot as a base and included elements from the other shots by using layer masks. Next, I add a color overlay layer which is set to “Overlay” blending mode. Using a normal brush, I grab colors that are already in the image and add color effects to certain parts of the image. For this image, I wanted the entire image to have a cold atmosphere, so I added a little bit of a bluish hue to the snow and surrounding areas. Not so much to throw the color balance off, but enough to give the feeling of back lit snow. I’ve also carried the amber color of the whiskey over to the table top, so we really feel like the liquor is glowing and warm. Using a “Levels” adjustment layer, I go back over the image and increase contrast in certain areas. I wanted to pull more attention to the bottle, to I darkened the areas around it by masking out the areas that I didn’t want to be affected. This is pretty close to the final balance of the image. Just before bringing it back into Lightroom, I sharpen and contrast the image by copying the entire canvas (Ctrl+A; Ctrl+Shift+V) and running a High Pass filter on the copied layer. The blending mode is set to Soft Light. But to me, it still feels too raw. Bringing it back into Lightroom, I can make some of my final adjustments. I use the radial filter and the adjustment brush to fine tune the brightness of areas that I want to draw attention to (such as the labels). To finish everything off, I like to throw in a little bit of split toning. I add some blue/green in the highlight areas and some blue in the shadows, and bam! A finished piece. 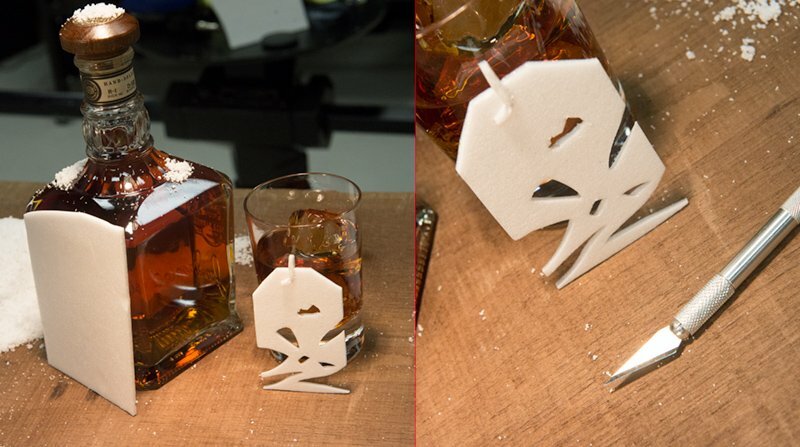 I hope you enjoyed reading through this holiday liquor shot tutorial. Every once in a while, it’s fun to break out of the norm, and do some outside-the-box thinking. Sometimes that involves accessorizing your image in unique ways. Even something like purposely putting something in front of your lens can come out interestingly. Don’t be afraid to push yourself creatively. If you have the technical ability and the creative chops, it can push your work beyond what people usually expect. Whether it’s yours, a client’s, or even a family member’s, every expectation you exceed is an improvement. So, go out there and blow away some expectations. Merry Christmas, Happy New Year, and happy shooting!